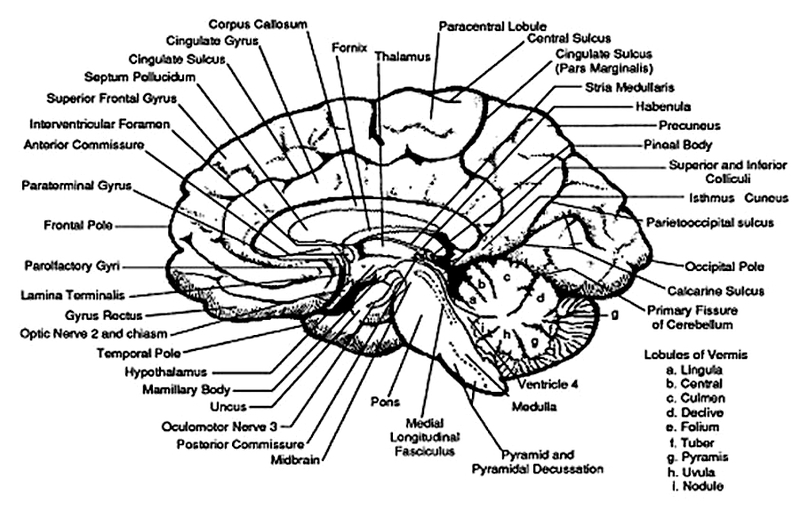 The brainstem consists of the medulla (myelencephalon), the pons (metencephalon), and the midbrain (mesencephalon). 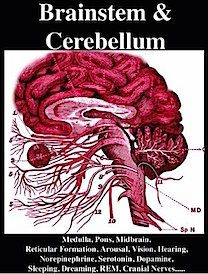 Straddling the dorsal surface of the pons is the cerebellum and spanning the length of the brainstem are the nuclei for cranial nerves 3-12 (see Carpenter 2014; Parent 1995) which will be briefly reviewed below. 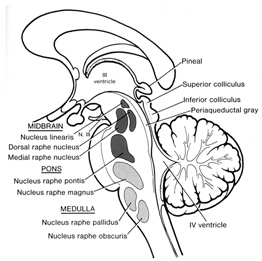 The most rostral portion of the brainstem, i.e. the midbrain merges with the diencephalon which in turn is surrounded by the cerebral hemispheres. 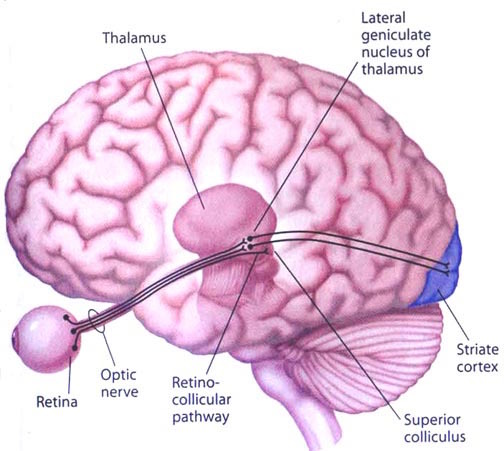 The more posterior portion of the midbrain consists of the superior (visual) and inferior (auditory) collicululi which are directly related to the thalamus, and the red nucleus which receives motor fibers from the cerebellum and frontal and parietal lobe. The dorsal roof of the midbrain is referred to as the tegmentum (which produces dopamine) whereas more centrally located is the substantia nigra, a major source of corpus striatal dopamine. 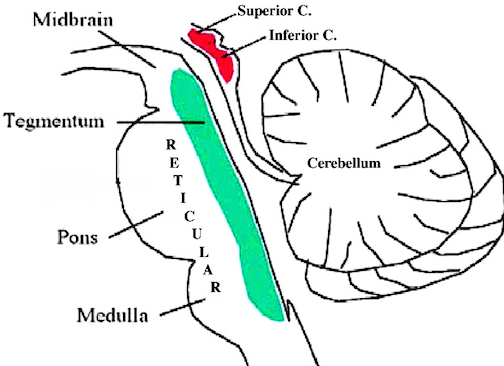 Spanning the medial and lateral lengths of the brainstem and midbrain is a complex reticulum of richly interconnected cells with long ascending and descending axons, collectively referred to as the reticular activating system, which is concerned with generalized and selective arousal and activation of the neuroaxis. 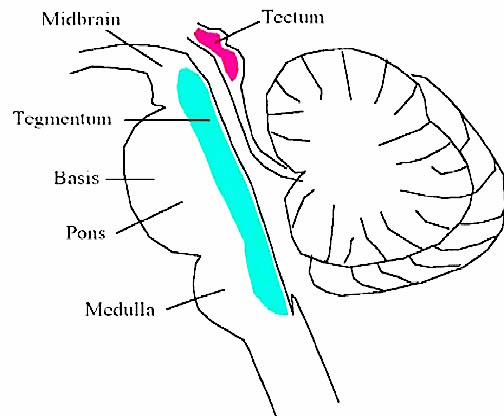 The pontine tegmentum and the more dorsal portion of the midbrain tegmentum is also considered part of the reticular formation through which course ascending sensory fibers and descending motor fibers. The midbrain is the least differentiated and the smallest segment of the brainstem and can be divided into three portions: a medial segment (the tegmentum) which includes DA manufacturing neurons and which represents the anterior continuation of the reticular formation (described below); the most recently evolved ventral segment through which pass descending cortical fibers; and the tectum which is dorsally located and includes the superior (visual) and inferior (auditory) colliculi. Located between and below the ventral segment and the DA producing (Mesolimbic) tegmentum is the substantia nigra which manufactures Dopamine. However, the most obvious structure of the midbrain is the pinkish colored "red nucleus", which receives descending motor fibers from the frontal lobe and gives rise to the rubrospinal tract which facilitates flexor muscle tone. 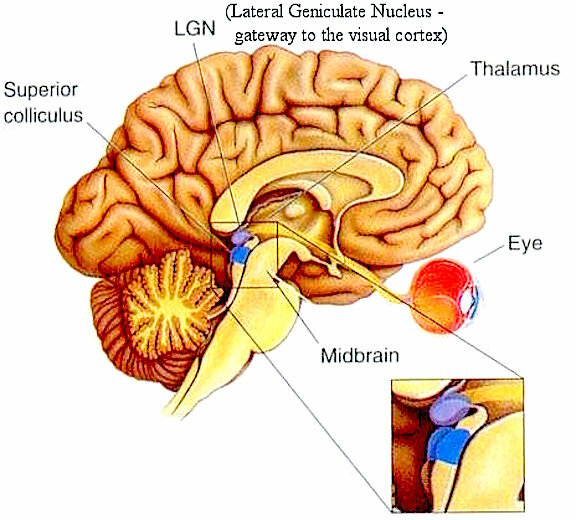 Also located within the midbrain is the periaqueductal gray, a nucleus which receives extensive input from the amygdala and other limbic nuclei and is implicated in the motoric-vocal aspects of emotional expression. For example, stimulation of the periaqueductal gray can trigger the production of a variety of sounds that are suggestive of exceedingly negative moods (Jurgens, 2004; Larson et al. 2004; Zhang et al. 2004). 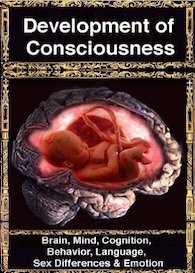 However, these "sounds" are pre-programmed, and with the exception of reflexive responding to noxious or painful stimuli, have no bearing on emotional state, as they are not accompanied by complex behavioral displays -that is, unless signaled by the forebrain. 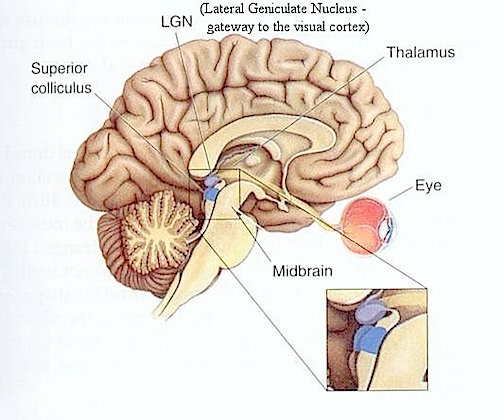 However, if the periaqueductal gray is disconnected from the limbic system and neocortex (such as by a midbrain transection), stimulation of this nuclei will continue to evoke vocalization. Specifically, the periaqueductal gray coordinates the activity of the laryngeal, oral-facial, and principal and accessory muscles of respiration and inspiration (Zhang et al. 2004). The coordinated activity of these tissues enables an individual to laugh, cry, or howl, even if the rest of the brain (excepting the brainstem) were dead and there was no evidence of consciousness. It thus appears that rather than a center for emotional vocalizations, the midbrain periaqueductal gray instead appears to be the site where particular vocalization motor patterns are stored. 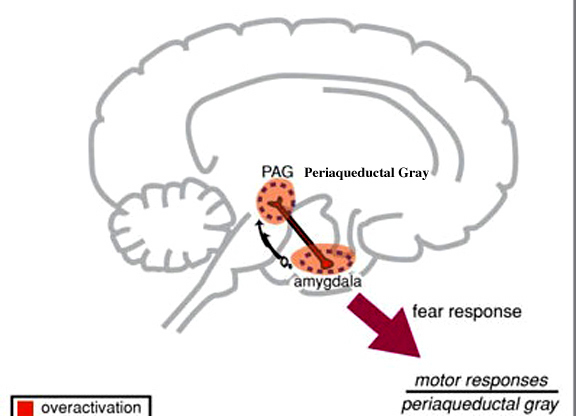 Hence, when the periaqueductal gray is activated by impulses received from the limbic system or neocortex (or via spinal nuclei involved in transmitting noxious stimuli), it activates the appropriate motor program and then organizes and coordinates the oral-laryngeal and respiratory muscles so that the appropriate sounds can be produced (Zhang et al, 2004). Presumably these neural motor programs are stored within the periaqueductal gray. 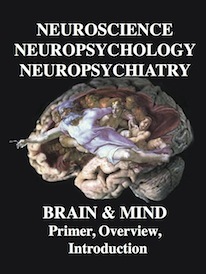 As pointed out in chapter 5, the brainstem (excluding the midbrain) may have evolved in a posterior-caudal and in an anterior direction so as to merge with the visual (midbrain) areas that probably initially supplied photopic derived energy to run the motor system and to arouse and energize the brain. 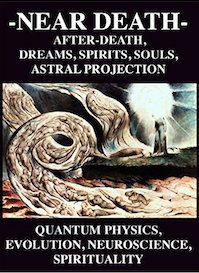 In this regard, evolution parallels ontogeny (see chapter 23). As also detailed in chapter 5, the anterior most segment of the midbrain and anterior pons, appear to have evolved from sensory-motor, and photosensitive cells. Due presumably in part to its photosensitive origins, and thus its concomitant ability to extract energy, the midbrain-pontine region of the brainstem developed the capacity to respond to light vs darkness, and to manufacture various neurotransmitters; e.g. serotonin, dopamine, and norepinephrine. In this manner the brainstem is able to exert widespread influences on cerebral arousal and neural transmission. 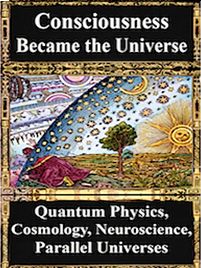 Over the course of evolutionary development, the capacity to respond to visual input increased beyond detecting light vs shadow, and soon came to include motion, as well as the ability to rotate the eyeballs and focus the retina via cranial nerves 2, 3, 4, 6. These complex functions in turn became subject to the control of the superior colliculus (or tectum). 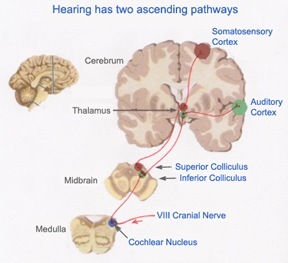 However, with the evolution of "hearing" the midbrain became increasingly modified to subserve complex auditory functioning as well, which in turn became associated with the evolution of the inferior (auditory) colliculus. In this regard, just as the control and governance of motor functioning becomes more complex and hierarchically (caudal to anterior) organized, so too does sensory analysis and related sensory-motor integrative functions which take place within the midbrain. Multi-modal processing and complex behavioral reactions, and the integration and analysis of auditory, visual-tactile, and even motor stimuli are characteristics of the visual (superior) and auditory (inferior) colliculi of the midbrain. Brain of a fish 300 mya. The superior colliculi are located in the anterior half of the midbrain. Although the midbrain per se is not well differentiated, these nuclei consist of gray and white layers and resemble cerebral cortex (Carpenter 2014). As noted in chapter 5, neocortical layers I and VII (between which are sandwiched layers II-VIa), in turn appear to be related to and/or an outgrowth of the midbrain. The superior colliculi can be functionally divided into superficial and deep layers which subserve somewhat different functions. (Cowie & Robinson 2004; Davidson & Bender 2014; Weller 1989). For example, the superficial layers receive considerable input from the retina as well as temporal and occipital visual cortex, and respond to moving stimuli. The superficial layers also project to vision related cranial nerve nuclei. 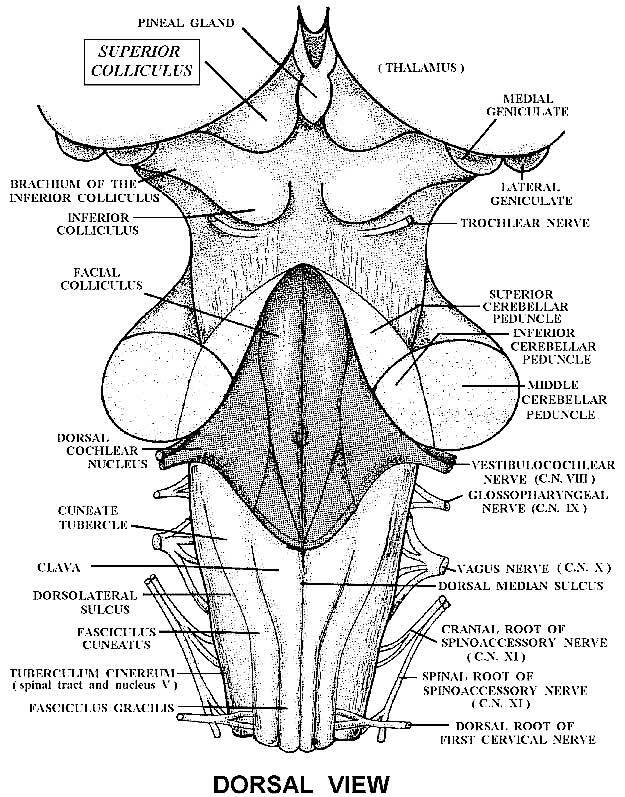 By contrast, the intermediate and deeper layers receive converging motor, somesthetic, auditory, visual and reticular input, and in fact serves as an extension of the reticular formation, and maintains interconnections with the caudal medulla and those cranial nerves associated with movement of the head. Hence, these layers serve as a multi-modal assimilation area which is concerned with orienting toward external stimuli and movement; particularly movements of the head and eyes during gaze shifts (Cowie & Robinson 2004; Davidson & Bender 2014; Keller & Edelman 2004). The deep and superficial portions are also intimately interconnected (Carpenter, 2014; Parent 1995) and both receive extensive optic input from the contralateral eye, and contralateral visual input from the ipsilateral eye. Moreover, they receive ipsilateral projections from the neocortical visual areas regarding the contralateral half of visual space. Hence, each colliculus is concerned with either the right or left half; i.e. the contralateral half of visual space. In addition, the colliculi receive input from the frontal eye fields. As noted, cells within the colliculi are responsive to visual motion and many tend to respond only to movement in a certain direction (Davidson & Bender 2014). Most do not respond to stationary stimuli. Given that reptiles, amphibians, and fish are devoid of higher cortical centers, it thus appears that the colliculi evolved so as to detect the presence of prey (or predators) and to guide orienting reactions and thus movement related to escape or food procurement. The inferior colliculus (IC) is predominantly concerned with detecting and analyzing auditory stimuli, and in fact is tonotopically organized; i.e. neurons are arranged in a laminar pattern which represents different auditory frequency bands (reviewed in Carpenter 2014; Brodal 2009). The IC can also respond to sounds arriving from either ear. This enables the IC to analyze and localize the source of various sounds and to correlate them with their various spatiotemporal characteristics. In this manner, sounds can be identified as coming from a certain direction and from a specific source. The IC sends fibers to the pons and medulla as well as the superior colliculus, and relays auditory inpulses to the spinal cord, and the nuclei subserving the neck and facial musculature (Henkel & Edwards, 1978; Wright & Barnes, 1972). Hence, via the IC, auditory impulses can trigger head and body turning and thus orientation toward sound sources. In mammals, the IC also acts to relay auditory signals received from the lateral lemniscus to the medial (auditory) geniculate of the thalamus, and in this regard it serves not only to analyze and orient toward auditory stimuli, but as a major auditory relay nucleus. 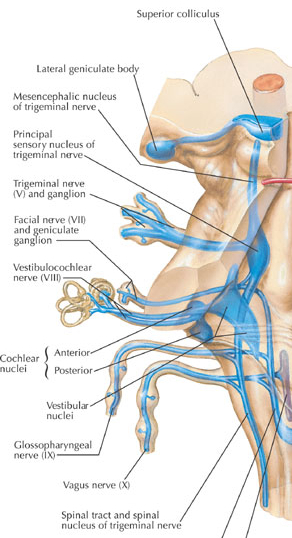 However, in this regard it is completely dependent on cranial nerve nuclei subserving the vestibular-cochlear system; cranial nerve VIII which is located at the pontine, medulla junction. Long before amphibians left the sea to take up life on land and in the air, fish had already learned to detect and analyze sounds made in the water. This was made possible by a structure located along both sides of the fish's body, called the lateral line. The lateral line is very sensitive to vibrations including those made by sound. The mammalian auditory system, however, did not evolve from the lateral line but from the vestibular nucleus (chapter 5). The human brainstem vestibular nucleus is very sensitive to vibrations and gravitational influences and helps to mediates balance and movement, such as in swimming and running. 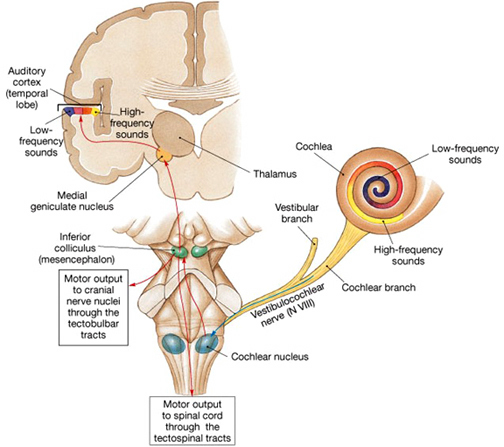 Over the course of evolution, it is through the vestibular nucleus (and the amygdala) where the first neuronal rudiments of "hearing" and the analysis of sound also took place. Among all mammals this is a function the vestibular nuclei continues to serve via the signals it receives from the inner ear; the brain's outpost for detecting certain vibratory waves of molecules and their frequency of ocurrence. Initially, however, the auditory system also evolved so that organisms could turn and orient toward and localize unexpected sound sources. This was made possible by messages transmitted to the midbrain inferior colliculus. This includes things that go bump in the night such as the settling of the house and the creaking of the floor, all of which can give rise to alarm reactions in the listener (in their amgydala). This is a sense humans and their ancestors have maintained for well over several million years, its main purpose being to maximize survival via the detection of approaching predators. 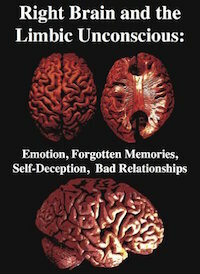 In fact, the inferior colliculus (as well as the amygdala of the limbic system) was the main source of auditory analysis two hundred million years before the evolution of neocortex (see chapter 5). This is a function it continues to perform among modern day reptiles, amphibians, sharks, as well as mammals. Among mammals the cochlear nucleus in turn projects auditory information to three different collections of nuclei. These are the superior olivary complex, the nucleus of the lateral lemniscus, and, as noted, the inferior colliculi. A considerable degree of information analysis occurs in each of these areas before being relayed to yet other brain regions such as the amygdala (which extracts those features which are emotionally or motivationally significant), and to the thalamus where yet further analysis occurs. Among mammals, from the thalamus and amygdala, auditory signals are transmitted to the primary auditory receiving area located in the neocortex of the superior temporal lobe; Heschl's gyrus. Here auditory signals undergo extensive analysis and reanalysis and simple associations begin to be formed. However, by time it has reached the neocortex, auditory signals have undergone extensive analysis by the thalamus, amygdala, and the other ancient structures mentioned above. 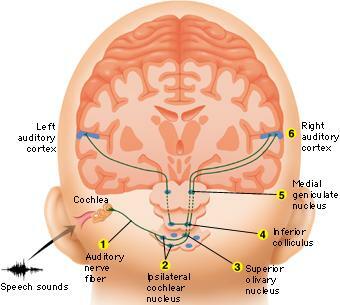 Brainstem mechanisms involved in vocalization includes control over the respiratory mucles; control over the vocal cords so that one can phonate; control over the pharyngeal, oral and nasal passages which effect resonance; and control over the palate, tongue, lips and mandible which control articulation. However, articulation also requires a mixture of nonvoiced and voiced (plosive) sounds (e.g. "puh, guh, kuh")-- which require a strong puff of air. In part, these functions are under the control of the midbrain periqueductal gray, as well as cranial nerves 12, 10, 9, 5, & 7. In order to expel air through the mouth the soft palate must elevate to close off the nasopharynx from the oropharynx. If the subject articulates plosives poorly with air escaping through the nose, the palate is not properly elevating which suggests a lower brainstem lesion. Speech may sound hypernasal; or, conversely if there is insufficient air pushed into the nose, hyponasal (as if the nose has been pinched closed during speech); which may also be due to nasal obstruction. . Absence of any phonation is called aphonia. Faulty articulation as a result of a forebrain or brainstem or muscular lesion and is called dysarthria. If the individual cannot speak due to a nerve or muscular lesion it is called anarthria. Because nerve 10 is associated with the palate (articulation), pharnyx (resonance), and larynx (phonation) disorders of speech and swallowing may be due to a lesion to this nerve or its bed nucleus. However, not just phonation and articulation but swallowing and respiration would be effected by lesions in this vicinity. As such, individuals may articulate, phonate, and inhale and exhale inappropriately while speaking and may even sound as if they are laughing or crying when in fact inspiration and expiration are effected. This latter condition has been referred to as a bulbar palsy. However, with severe bilateral lesions of the corticobulbar fibers, patients may lose the ability to speak or swallow and become mute and comatose. In the recovery phase or with gradual lesions of the corticobulbar tracts, the patient shows a characteristic, virtually pathognomic syndrome termed pseudobulbar palsy: He initiates speaking or swallowing very slowly, slurring words, with the voice having a peculiar strained pitch and quality. In addition, there is much emotional lability, crying one moment, laughing the next. The patients face, most of the time, appears immobile as though it were a wooden mask. However, when he laughs/cries, the facial movements return and become greatly exagerated and prolonged. However, when questioned, the patient will claim that he does not feel the emotion being conveyed. As noted, the midbrain periaqueductal gray coordinates the activity of the laryngeal, oral-facial, and principal and accessory muscles of respiration and inspiration (Zhang et al. 2004). The coordinated activity of these tissues enables an individual to laugh, cry, or howl, even if the rest of the brain (excepting the brainstem) were dead and there was no evidence of consciousness. Laughter and crying often involves activation of the entire musculature of the face, including the muscles of the throat, jaw, diaphragm, and to a lesser extent, the neck, chest, and abdomen. Laughter is also accompanied by respiratory expiration, whereas crying is associated with inspiration, such that rhythmic waves of air rush over the larnyx giving rise to the phonation of laughter, or the sound of sobbing. Laughter and crying are therefore dependent on the functional integrity of the periaqueductal gray, as well as the pons and medulla, cranial nerves 12, 10, and 9, 5 and 7. 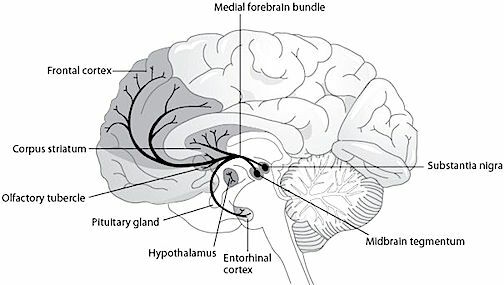 However, the correspondence between the motoric-expressive and the felt aspects of emotion are maintained and dependent on two supranuclear pathways: the cortico-bulbar which arises in the frontal motor areas, and the fronto-limbic-pontine-medullary pathway which arises in the orbital frontal lobes and comes to include the medial frontal lobes and anterior cingulate, the hypothalamus, amygdala, periaqueductal gray and brainstem. It is this latter pathway which is responsible for conveying the felt aspects of emotional expression, such as is involved in laughter and crying (see chapter 13). 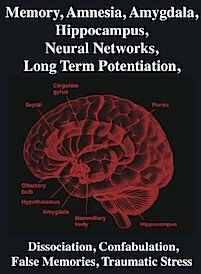 When the functional integrity of these interconnections are disrupted, such as due to a progressive bulbar (pontine-medullary) palsy, brainstem hemorrhage, tumor, amyotrophic lateral sclerosis (ALS), or related injuries to the hypothalamus and deep orbital area, pathological laughing and/or crying may be triggered or reflexively released via brainstem activation. Specifically, crying is conveyed via prolonged bursts of respiratory inhillation, and laughter via sudden bursts of expiration. That is, what appears to be "laughter" is actually an uncontrolled and sustained clonus accompanied by an explosion of air passing over the larynx which repeats itself in a series of bursts. If the expiration is sustained, the sound produced becomes distorted and the patient may sound as if wailing or even screaming. 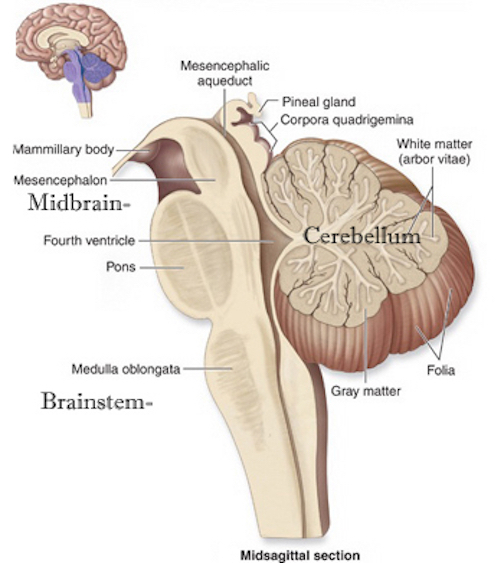 Essentially the periaqueductal gray and the lower brainstem have been released and disconnected from forebrain control such that normal brainstem activities, e.g. vocalization, become uncontrolled. Moreover, as the brainstem nuclei mediating facial expression are also effected, facial expression is also out of control. The face becomes contorted and seemingly expressive of extreme happiness or grief although patients will deny experiencing these feelings -although they may feel distressed and embarrassed by what is happening. As described by a patient with ALS: "I begin to smile, but the smile becomes an exaggerated grin, which attaches itself to my face... [then]... I become angry, humiliated, and subject to uncontrolled tears. You have no idea how terrible it is when the crying is fully triggered and takes hold like a seizure. I can't control any of it. I simply disintegrate" (Lieberman & Benson 1977, p. 717-718). 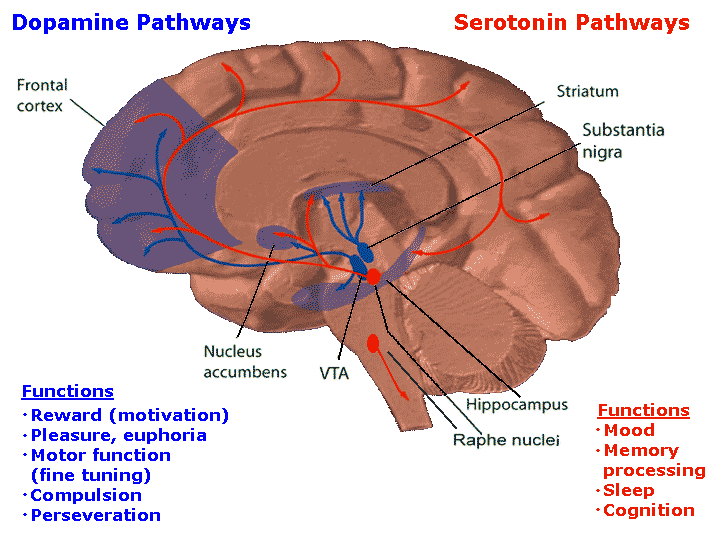 The midbrain contain neurons and nuclei that are responsible for manufacturing monamine neurotransmitters, i.e. dopamine (DA). DA is produced predominantly within the midbrain substantia nigra and tegmentum. 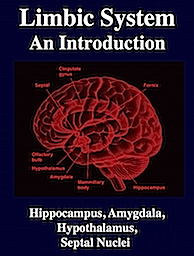 Dopamine is believed to play a dominant role in cognition and motor functioning, and disturbances in the DA transmitter systems are closely related to the development of Parkinson's disease and psychotic abnormalities (see chapter 16). For example, reductions in corpus striatal DA are associated with catatonia and Parkinson's disease, whereas excess DA has been linked to paranoid and psychotic disturbances (chapter 16). However, the nature of the disturbance is also dependent on which DA system is effected; i.e. substantia nigra-corpus striatal or tegmentum-limbic striatum. For example, the midbrain ventral tegmentum (A10 DA cell group) provides dopamine to the amygdala, limbic striatum, and the ventral caudate and putamen and is believed to be related to emotion, mood and reward (referred to as the mesocorticolimbic/mesolimbic DA system). The mesolimbic DA system can therefore enhance or depress emotional-motoric expression. The substantia nigra DA system is related to motor functions including the production of stereotyped and routine actions (Fibiger & Phillips, 1986; Robins & Everitt 1992; for related details). 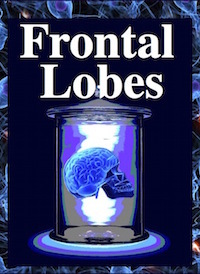 Prominent projections sites include the dorsal caudate, putamen and medial frontal lobes. The nigrostriatal and mesolimbic DA system sometimes act in oppositional as well as in a complimentary and mutually supportive manner. For example, the release of DA occurs in response to specific biologically significant stimuli, which in turn may activate the limbic and corpus striatum and thus trigger motor activity such as approach or withdrawl (Fibiger & Phillips 1986; Robins & Everitt 1992). However, if one (or both) of these two DA systems becomes dysfunctional, counterbalancing influences are removed which may result in excessive activity within the supposedly "normal" DA system and related nuclei. Hence abnormalities in these DA systems may induce hyperactivity and mania or conversely a poverty of movement (e.g. Parkinson's symptoms and catatonia). As noted in chapter 5, midbrain neurons, being derived, in part, from photosensitive cells, also display circadian and natural rhythms that may well have been induced via adaptions to changes in the light-dark cycle. 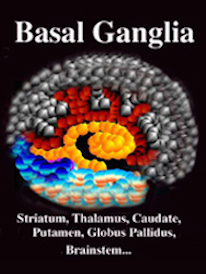 Similarly, DA neurotransmission also displays circadian variations, which in turn is reflected by cyclic motor and DA activity within the caudate nucleus, and less so within the limbic striatum (Paulson & Robinson 2004). The pontine and medullary brainstem significantly contributes to cortical arousal, attention, sensory and motor facilitation and inhibition, and the orienting reaction. This is made possible through ascending limbic, thalamic, and neocortical influences, and descending inhibitory influences on brainstem and spinal sensory and motor nuclei. In this manner the brainstem is able to selectively arrest and activate specific movements (NE/ACh), while simultaneously filtering out distracting or irrelevant sensory stimuli (presumably via 5HT influences) so that attention may be selectively directed and maintained (see Klemm, 2013; Steriade & McCarley, 2010). Brainstem motor and sensory filtering and inhibition is also made possible via reticular neuronal modulatory control over arousal; i.e. the reticular activating system. The brainstem reticular formation consists of a number of morphologically distinct nuclei and neurons (see Blessing, 1997; Steriade & McCarley, 2010; Vertes, 2010) which differ in regard to size, shape, number and orientation of dendrites, and axonal patterns of projection. It is via these nuclei that the reticular formation can exert widespread influences on motor and sensory functioning as well as arousal. For example, cranial nerve and sensory fibers originating in the spinal cord give off collaterals as they ascend or terminate in the brainstem reticular formation (Brodal, 2009; Pompeiano, 2013). 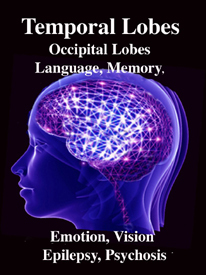 This includes auditory and visual fibers originating in the midbrain tectum (Edwards, 1980). The more lateral portions of the reticular formation consists of short axons which richly innervate adjacent brainstem nuclei and which are connected to the collaterals of the various sensory tracts. Specifically, the ascending reticular activating system consists of a multi-neuronal, polysynaptic core that conveys, via long central axons with numerous laterally projecting collaterals, nonspecific impulses to the forebrain. These long axons ascend via the central tegmental tract which projects to the intralaminar nuclei of the thalamus. Many of these core reticular neurons are concerned with motor activation and inhibition as well as alerting and arousal functions so that motor functioning is coordinated with forebrain sensory processing. By contrast, fibers from the medial reticular formation project to the limbic system. The sensory tracts, including those involved in transmitting noxious stimuli, are exceedingly important in maintaining arousal. If these sensory tracts are severed at the brainstem level, patients may become exceedingly letharthic, and even apathetic. Similarly, destruction of the olfactory, auditory, and visual pathways, even at a peripheral level, can result in prolonged lethargic states (see Steriade & McCarley, 2010). This indicates that sensory imput, from the periphery to the brainstem, and up through the thalamic level is exceedingly important in maintaining arousal and cortical alertness, as well as the waking state. However, destruction or interruption of these long ascending sensory pathways (i.e. the lemniscal systems) that span the spinal cord and terminate in the thalamus, does not eliminate the cortical arousal response. This is because forebrain arousal is dependent on the reticular formation which receives collateral sensory fibers from these ascending systems. Thus, whereas lateral brainstem injuries may create lethargic and reduced states of arousal, destruction of the core brainstem reticular formation can result in a loss of forebrain arousal and create a permanent comatose state such that the patients or animals may not even respond to noxious stimuli (French & Magoun, 1952; Lindsely, et al. 1950). 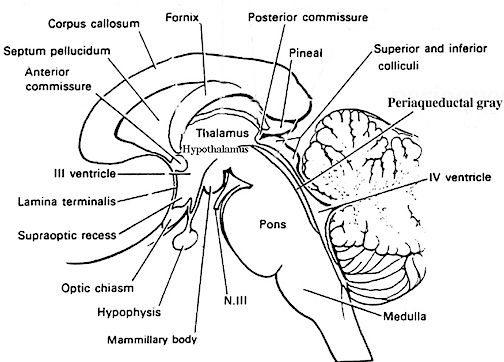 Indeed, transection of the brainstem just a few millimeters below the visual and auditory colliculus also induces coma. 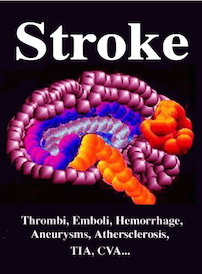 However, this is not only a consequence of a loss of reticular input to the forebrain, but a loss of forebrain (and frontal lobe) and midbrain input to the brainstem reticular formation (Bremer, 1975; see also Steriade & McCarley, 2010). 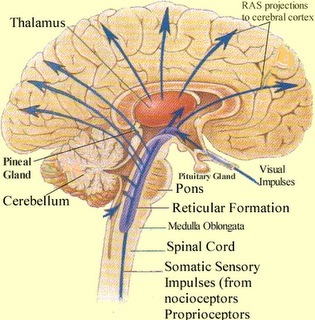 Just as the complexity of motor programming increases as one ascends the brainstem, so to does control over arousal. For example, if the transection is in the upper brainstem (i.e. at the pons, trigeminal level) well below the tectum, the subject continues to demonstrates EEG signs of alertness, as well as visual tracking eye movements (reviewed by Steriade & McCarley, 2010), although they are otherwise in a coma. However, if the lesion is more anterior at the midbrain level, the subject becomes completely comatose and unresponsive --which indicates an important role for the midbrain reticular formation in maintaining cortical and forebrain arousal. 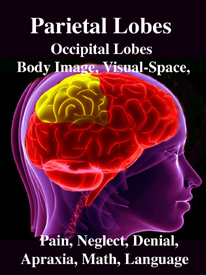 However, if the lesion is anterior to the midbrain, rather than coma and a loss of arousal, there results a loss of control over arousal such that environmental stimuli may be ignored or neglected. For example, if the immediately adjacent thalamus is lesioned (which is the terminal junction of many reticular fibers), this may result in complete neglect of auditory, visual, and tactual space, depending on the laterality of the damage. Presumably this is a consequence of an inability to transmit or relay sensory stimuli or to activate the neocortex, for with lesions to the thalamus, cortical EEG desynchronization is usually absent regardless of brainstem activity (Steriade & McCarley, 2010). Conversely, if the lower brainstem is lesioned, the patient not only become comatose, but cardiovascular and respiratory disturbances will result. Hence, the patient may die.